One of the hot topics of the day is how to improve employee engagement. Together public and private sector organizations have invested billions of dollars in trying to crack this nut. The Office of Personnel Management has established a high priority goal of improving performance management and employee engagement, using the Federal Employee Viewpoint Survey as a measuring stick. Their recommended approach is for agencies to identify the lowest level work units in each component and then to turn to OPM for assistance by using a tool developed by the National Institute for Health to analyze FEVS results. OPM also wants agencies to report how they will communicate FEVS results to all employees and how they plan to ensure that every organizational level is taking action to improve their results. There is nothing wrong with OPM’s suggested approach. It is a tried and true approach the government typically takes to solve problems. However, I suggest that agencies look at their FEVS results from a different perspective. That is, they should ask themselves what do their results tell them about their culture and what can they do to improve it? By looking at their results from this perspective, rather than focusing on a short-term fix to a narrower problem, they are more likely to make a fundamental change in their culture that will better position them for the long-term. The point here is that if employees’ perceptions, behaviors and understandings are properly communicated, reinforced and shaped, they will result in a better organizational culture, improved performance and more committed and engaged employees. 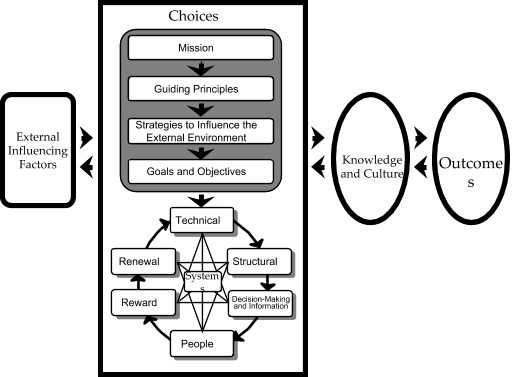 As the model beautifully demonstrates, your organization’s knowledge and especially its culture, and ultimately its performance, flow from its design choices and how successfully they are implemented. Thus, the best way to drive employee satisfaction is to make choices that align with your desired culture and to then properly and relentlessly implement them. I see two options that make sense for organizations that want to go forward and truly improve their employees’ viewpoint. Option one is to use your current work design but improve your systems and the way you manage them. Option two is to change your work design by moving from a top down, command and control organization to one that features teams, or better yet, teams of leaders. Improve your current work design. This means primarily doing the same things you always do, but doing them better. You still operate with a wide range of managers and supervisors, but they are much better developed and work within more cohesive and consistent systems. For example, for this option to work, the supervisors must communicate very well with their subordinates, place a premium on developing them, involve them where possible in key decisions, frequently apprise them as to what is going on and why, and then hold everyone accountable in a fair and equitable manner. Obviously, that is not an easy thing to do and is one reason why billions of dollars are spent every year on supervisory training. Another thing they absolutely must do is deal with difficult employees, rather than moving them, which is what is often done. True accountability in government is crucial, but as the FEVS shows, is rarely accomplished. Regarding the management systems, they must fit together as a whole and send a clear and consistent message to everyone. For example, if you want people to be focused on your goals, make sure they are aware of them, know what they mean and why they were chosen and constantly see how they are doing relative to them. If you want people to work together, make sure you offer both individual and group rewards. This approach can be accomplished relatively quickly, since it does not entail a wholesale change within your organization. However, it does require a high degree of focus, a willingness to make different choices when appropriate, and a strong commitment to continually developing your supervisors. Change your work design. By this I mean converting to a team-based environment, where you have fewer supervisors and where every employee is better developed, more involved in day-to-day management of their team, understands the value that they create for the team and where each team member feels as though they are vital parts of the team/organization. This approach has many advantages since the supervisors are freed up to perform higher-level work such as strategic planning, benchmarking, etc. The employees tend to be more involved and more engaged since they are no longer simply workers; they are in effect co-owners of the organization. Like the first option, this approach may require new design choices, although in this case they will probably be more radical. For example, the physical plant may need to be changed to accommodate teams. The performance standards should place a higher premium on teamwork. 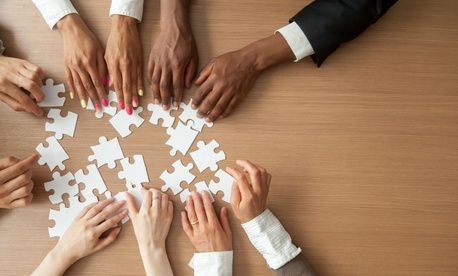 There will be a much greater emphasis on knowledge management and there will need to be more team-based meetings wherein everyone will have the chance to contribute. Such an approach can have a higher payoff than simply improving your current work design, because teams tend to outperform traditional units and groups by a wide margin. However, it also takes a larger investment of time, energy and planning to convert to teams and you may very well experience some short-term workload challenges during the transition. However, the payoff in terms of your culture and performance may well be worth it. No matter which option you choose, make sure you that virtually all of your design choices are visual. Posting your mission, goals, values and individual and group performance will ensure that everyone pays attention to the bottom line. It will also reinforce how important it is to your organization. By the same token, also post pictures and other displays of your customers, your organization’s history, your success stories, current and past employees, etc. When you take such an approach you will connect to people who are right-brain dominant and those who are left-brain dominant, meaning you will reinforce the culture you are trying to achieve with as many people as possible. When the displays go up in an effective manner, you will find that they will not only positively influence your employees; they will also shape the view of your headquarters, your customers and your stakeholders and that is not an easy thing to do.